Draft CIMEC “C-ITS Roadmap for European cities” published – give us your thoughts! 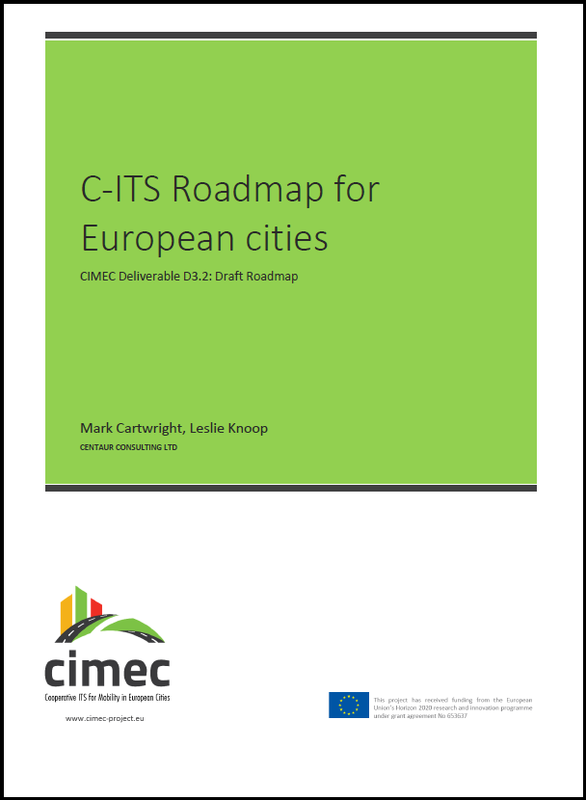 CIMEC has now published a draft of the C-ITS Roadmap for European Cities (project Deliverable D3.2 – available here). The Roadmap draws on an extensive consultation process with both city stakeholders and the ITS industry, and presents a practical and realistic view of how the urban C-ITS environment is likely to develop over the next 5-10 years. The Roadmap is intended to reflect a consensus view, that enables cities to plan for their future use of C-ITS in a way that yields real benefit at low risk; enables the industry to develop products on a timescale that is likely to meet a meaningful market demand; and enables policymakers to understand and address the residual challenges in achieving a coherent deployment of locally-relevant C-ITS across Europe. The project team is therefore keen to expose the draft Roadmap to the widest possible review. Please take a moment to download it and give us your thoughts, even (especially!) if you disagree with something we have said. Feedback should be provided to Mark Cartwright (mark.cartwright@centaurconsulting.co.uk) by 15 March 2017. Please note: in order to simplify review, the Roadmap has been prepared at three levels of detail: a full report (81 pages plus cover), a summary report (13 pages) and a one-page “flyer” (English, German, Spanish) suitable for senior staff.